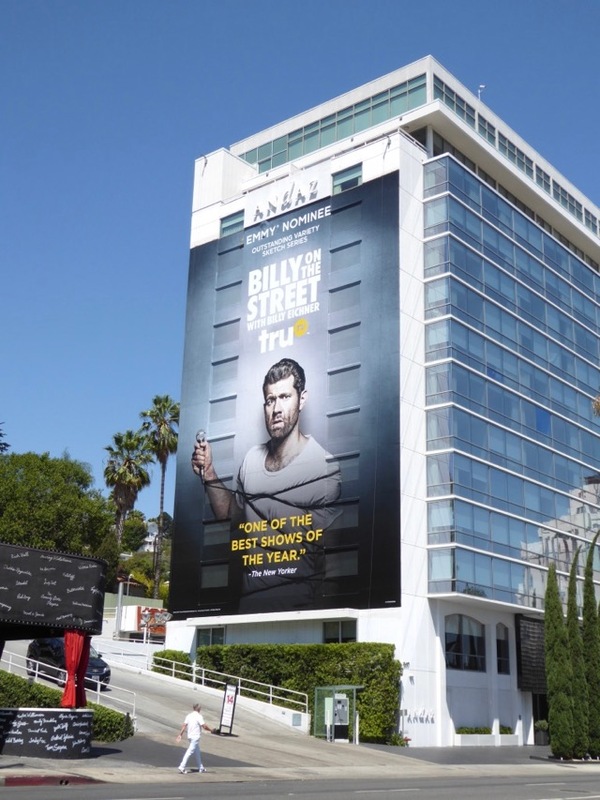 This week you've already seen all the Amazon, Netflix, HBO and FX Emmy nominee billboards crowding L.A.'s sprawling skyline, and today it's the turn of everyone else up for a shiny statuette. 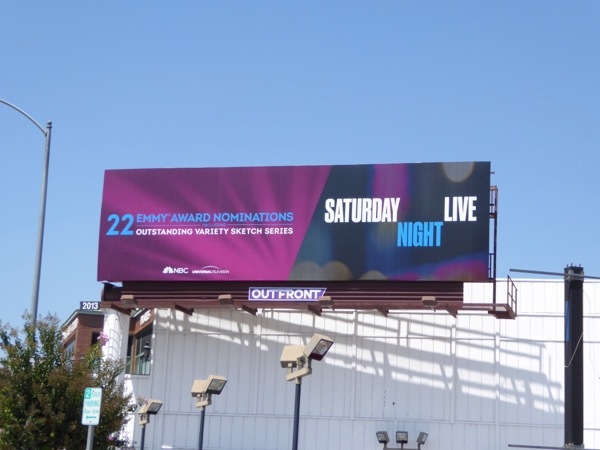 First up are these hilarious billboards for Saturday Night Live who received a whopping 22 nominations (tying with HBO's Westworld) for their 42nd season. 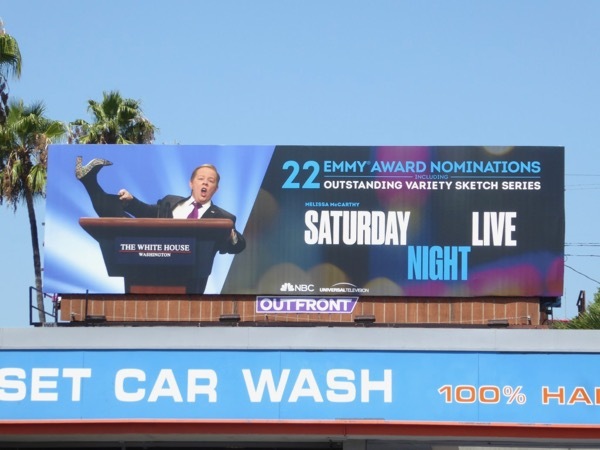 The infamous sketch and variety show proved that you could find the funny in the last Presidential Election and spent the season parodying Donald Trump, Hilary Clinton, Jeff Sessions and Sean "Spicey" Spicer. 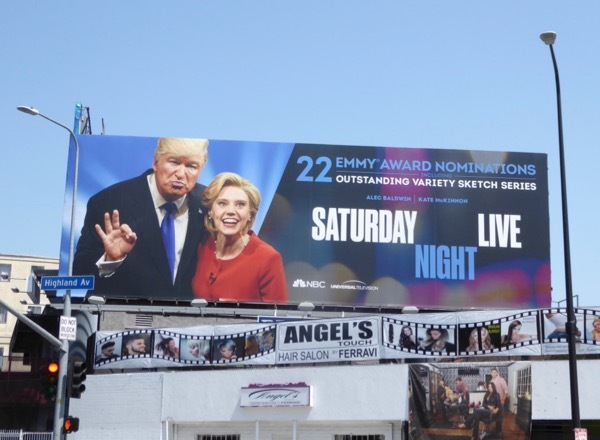 The faux Trump and Clinton Emmy nomination billboard featuring Alec Baldwin and Kate McKinnon was spotted along Highland Avenue on August 5. 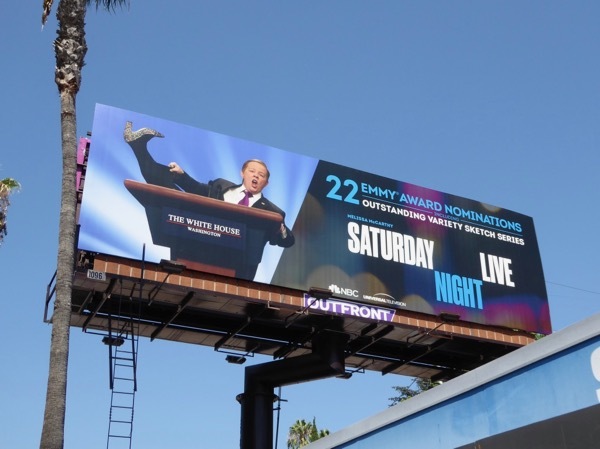 Meanwhile Melissa McCarthy's Spicey billboard was snapped along Sunset Boulevard on August 9, and the plain copy version was spied along Lankershim Boulevard on August 20, 2017. SNL deserves more than a few Emmys for keeping America (and the world) laughing through this horrific experience. Comedy Central's Drunk History received four Emmy nominations for its fourth season spoofing America's political and cultural past. 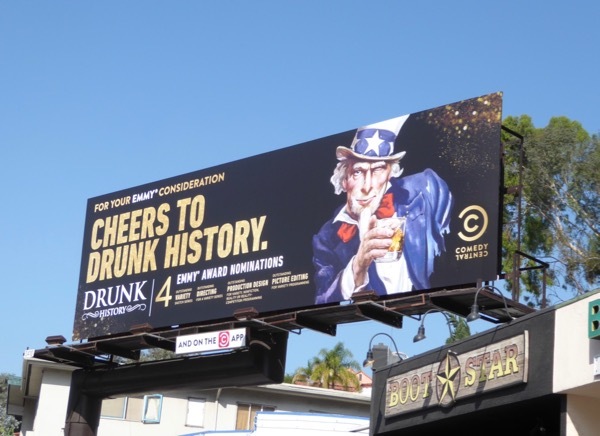 This Emmy nominee billboard with an inebriated 'Uncle Sam' raising a toast to show was snapped along the Sunset Strip on August 18, 2017. Let's see if the comedy will be celebrating this September at the 69th Emmy Awards. 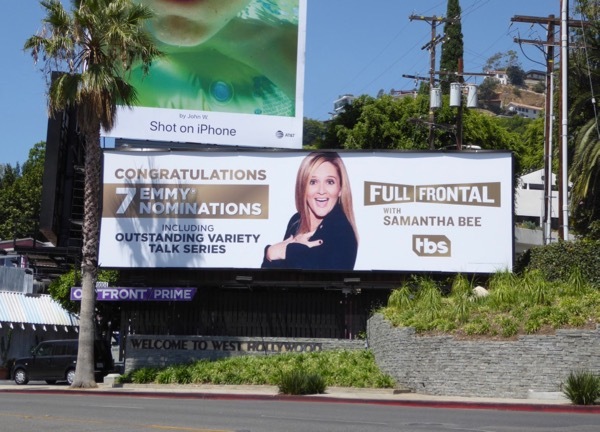 TBS really went to town in May and June supporting the second season of Full Frontal with Samantha Bee with a smattering of Emmy consideration billboards filling the city skies. 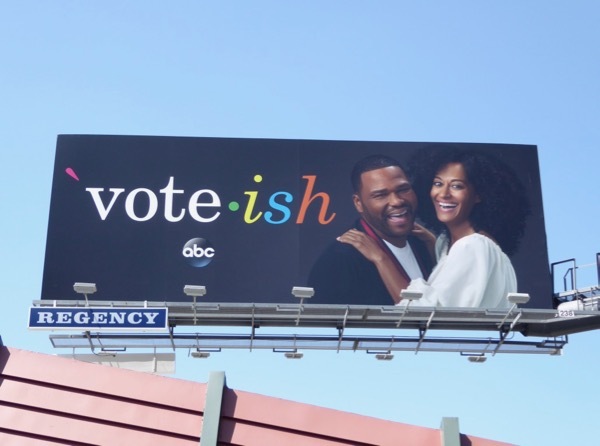 Their outdoor campaign paid off and the late-night show and its host garnered seven nominations in total, three for the weekly satirical show itself and four for the Not the White House Correspondents' Dinner special which aired at the end of April. With their razor sharp wit Samantha Bee and her team have been invaluable poking fun at the new administration and exposing their lies and fake news, proving that resistance is not futile. 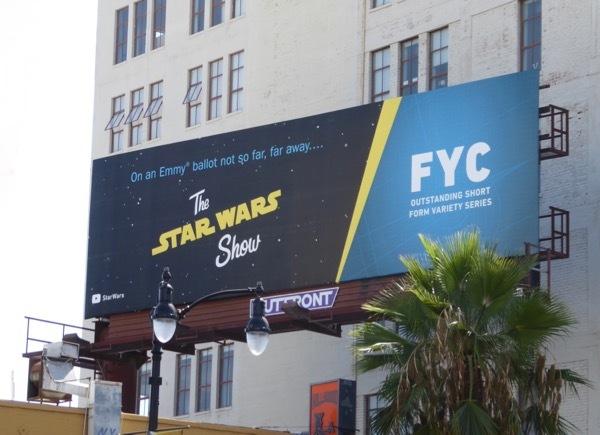 This billboard congratulating the TBS series was first spotted along the Sunset Strip on August 14, 2017. Meanwhile the fifth season of TruTV's Billy on the Street with Billy Eichner nabbed its first Emmy nomination this year. Obviously Television Academy voters appreciated the show's rapid-fire mix of celebrity games and interviews on the street with unsuspecting New Yorkers. 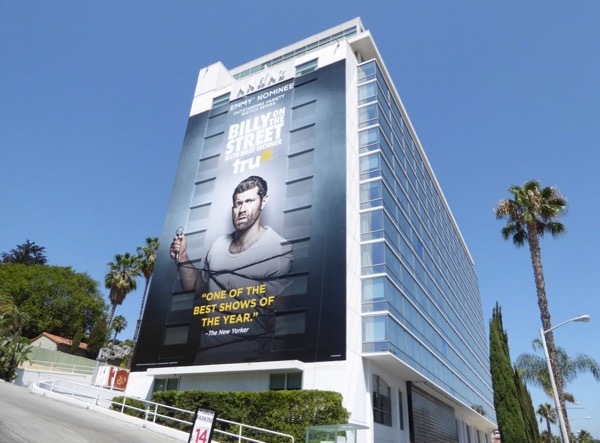 This super-sized Emmy nomination billboard was snapped along the Sunset Strip on the side of West Hollywood's Andaz Hotel on August 18, 2017. 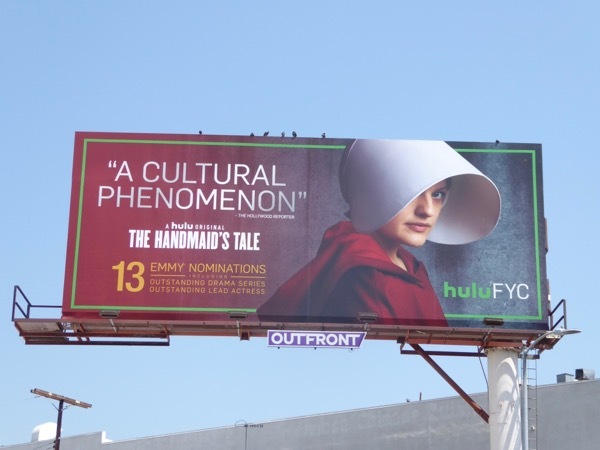 This TV season streaming platform Hulu really came into its own with the adaptation of Margaret Atwood's dystopian future novel from 1985, The Handmaid's Tale. 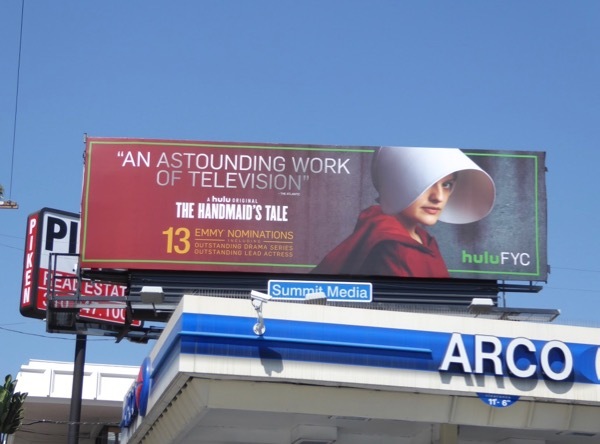 With its misogynistic and homophobic treatment of women and LGBT citizens oddly paralleling the situation in America right now it's no wonder the timely drama nabbed an impressive thirteen Emmy nominations, including for Elisabeth Moss for her portrayal of a handmaid and the living hell she goes through. 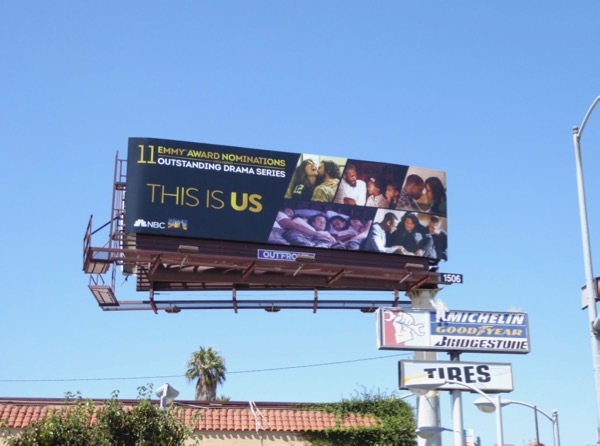 These Emmy nominee billboard for the debut season was snapped above Sunset Boulevard and Santa Monica Boulevard from August 2 to August 5, 2017. 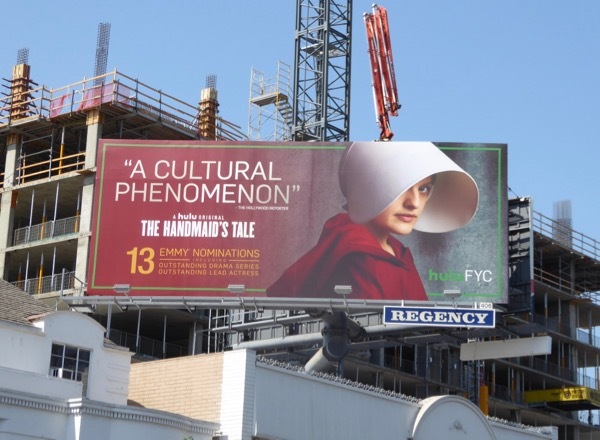 Fans of the show should also check out all these other Emmy consideration and series launch billboards for The Handmaid's Tale. 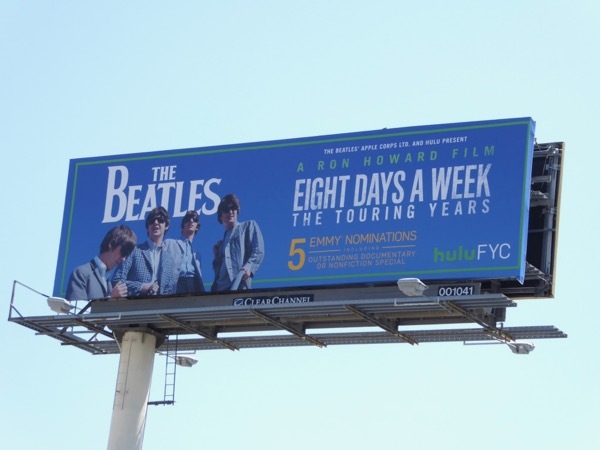 Hulu's Emmy nominations were also bolstered by Ron Howard's The Beatles music documentary, Eight Days a Week - The Touring Years, featuring found footage, music and interviews of the iconic British band's 250 concerts from 1963 to 1966. 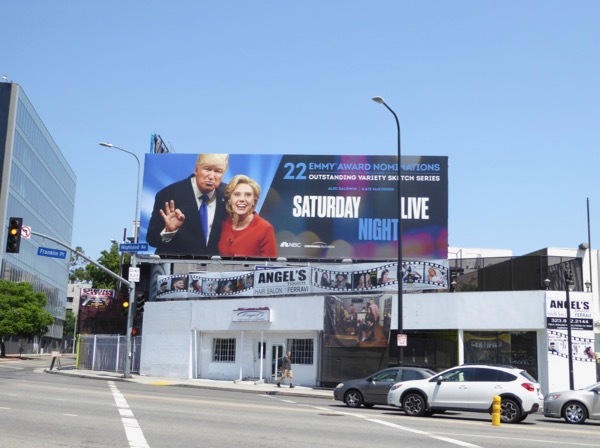 This Emmy nominations billboard was photographed above La Brea Avenue on August 20, 2017, and the film helped Hulu surpass fellow streaming service, Amazon, by two nominations this year. 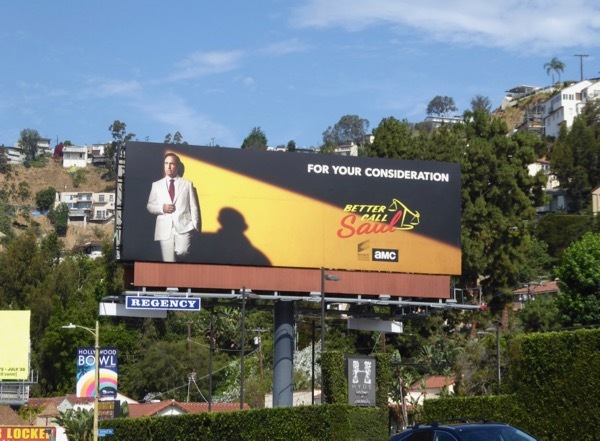 AMC's Breaking Bad spin-off prequel, Better Call Saul, continued to garner Emmy nominations this year adding nine more nods to make a cumulative total for its three seasons of 23. In addition to a nomination for Outstanding Drama Series, Bob Odenkirk was also nominated for Lead Actor for a third time, so will his luck change this season? 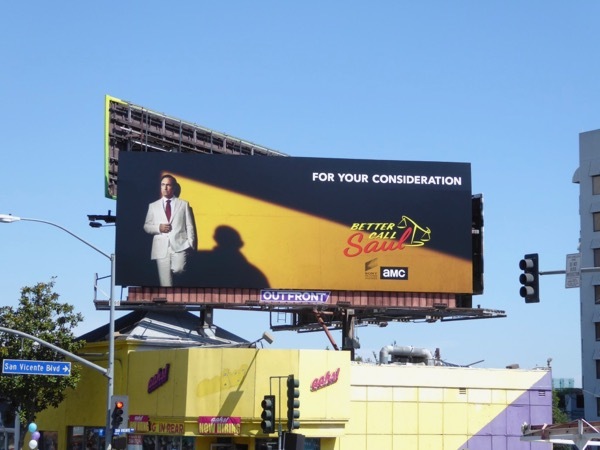 These striking Emmy nominations billboards for your consideration were first snapped along Sunset Boulevard on August 2, 2017, then further west along the Sunset Strip the next day. 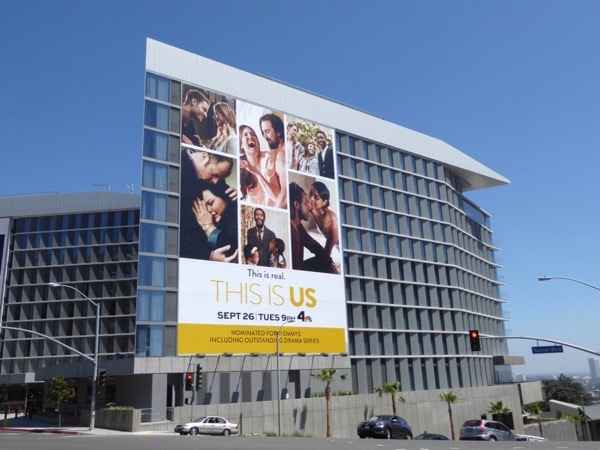 This year as a network NBC secured 63 Emmy nods, with freshman series This Is Us providing ten of those. Dan Fogelman's tearjerker drama which flashes back from the present to the past every episode following the lives of the 'Pearson' family initially scored eleven nominations, but a technicality with a costuming category for the episode 'Moonshadow', which didn't include enough costumes to qualify for the contemporary time period, reduced their total. 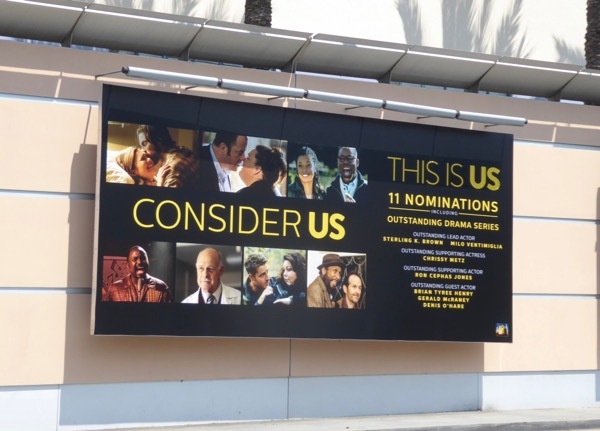 Regardless Sterling K. Brown, Milo Ventimiglia, Chrissy Metz, Ron Cephas Jones, Gerald McRaney, Denis O'Hare and Brian Tyree Henry all received recognition for their acting this debut season, alongside the show's Outstanding Drama Series nomination. 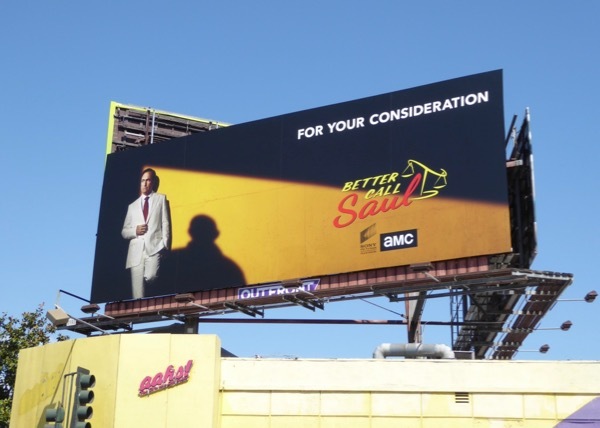 These Emmy nominee billboards for the hit drama, some of which have subsequently been amended to reflect the ten Emmy count, were snapped along Pico Boulevard, Sunset Boulevard and Fountain Avenue from August 5 to August 8, 2017. And on an Emmy ballot not so far, far away The Star Wars Show scored a nomination for Outstanding Short For Variety Series. 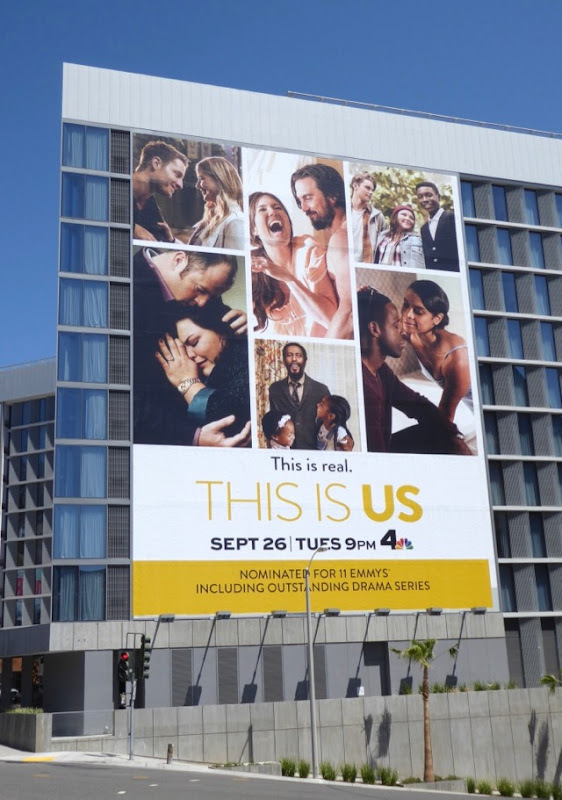 This billboard for the behind-the-scenes YouTube show was spied above Hollywood Boulevard on August 14, 2017. 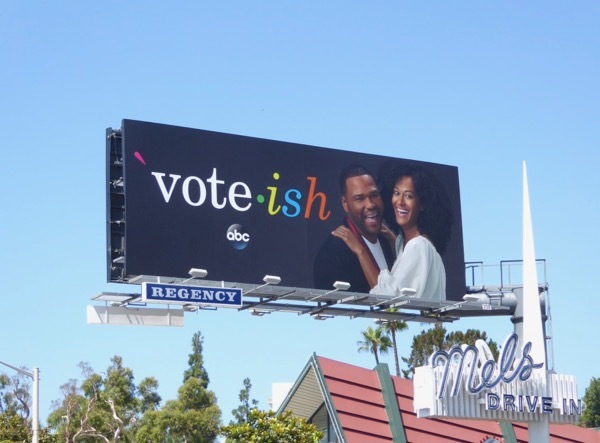 And finally, for its third season Black-ish was rewarded with four Emmy nominations including for Outstanding Comedy Series and for the head of the 'Johnson' sitcom family, Anthony Anderson and Golden Globe-winner Tracee Ellis Ross. 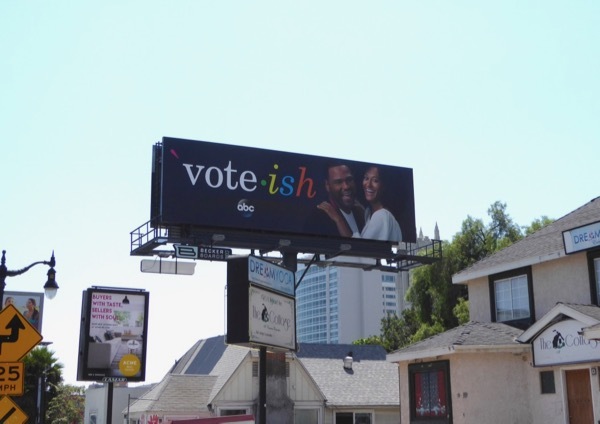 These fun 'Vote-ish' Emmy nominations billboards for the ABC comedy were spotted above Highland Avenue and Sunset Plaza from August 13 to August 17, 2017. 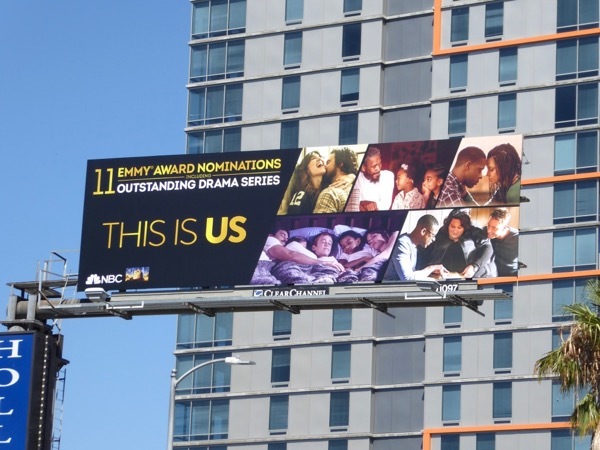 As you can see from all the Emmy nominee billboards featured this week it's a competitive awards season, but volume of outdoor ads don't necessarily win prizes. Daily Billboard can't wait to find out the winners this September, although we'll miss all these fab Emmy campaign ad creatives filling the skies of La La Land (until the Golden Globes and Oscars that is).